I’ve been invited to teach a three-part course at the Brooklyn Brainery, an amazing non-profit that offers classes for cheap. They’ve had educational sessions on everything from beekeeping to kimchi making to whiskey tasting to knife skills. So I’d like to put the question to you: If I were to teach a course based on the contents of this blog, what would you be curious to learn more about? The “cakes” are actually cookies; but the most interesting part of this recipe is the directions to “sprinkle colored caraway seeds on top.” Colored could perhaps mean “toasted.” It could mean dyed with natural dyes. It could mean candied. But does it mean that “colored caraway seeds” are proto-sprinkles? Jimmies? Hundreds and Thousands? At any rate, I decided not to make these cakes for my birthday: I anticipate them to be floury, dry, and full of currants. Very 19th century and not my favorite style of cookie. Instead, I’m baking an apple up-side-down cake and a plum cake, and my friend Jeffrey is arriving with a vegan delight. The more cakes, the better, I say. I was on Edible Magazine’s “Let’s Eat” segment for New York 1 today! It plays again on Sunday if you want to catch it on the air; or, you can check it out on NY1’s website at the link below. Edible: Historical Gastronomist Takes On Classic Recipes In Her Long Island City Kitchen. I’ll post the recipe for the chestnut ice cream I make early next week; it was incredibly delicious. Carving the beaver tenderloin roast. One of the requirements of my Alaskan Culinary Challenge is to serve the beaver meat to at least one other person. So I put out an APB on Facebook to see who might be interested in trying some beaver; I ended up with a party of eight willing participants at my house. I decided to test three different recipes for beaver. I wanted to cook one portion of beaver with very little seasoning, so we could really taste the beaver flavor. I had one packet of meat labeled “beaver tenderloin,” so I decided this most tender cut of meat would get the simplest treatment. The tenderloin was cut into several smaller slices, so I decided to tie them into a little 1-pound roast with a bit of kitchen twine. Thomas De Voe did say beaver was best roasted. I seasoned the roast with some fresh ground pepper and kosher salt. I heated a cast iron skillet with some clarified butter until the surface was smoking. Then I placed the roast in the skillet and slid the whole thing into a preheated, 500 degree oven. I let it roast 8 minutes, then pulled it out and let the meat rest 10 minutes, covered with tented aluminum foil. Then I carved it into tasting portions and delivered it to my eagerly awaiting guests. Searing the soy & garlic beaver. I adapted this recipe from an MFK Fisher recipe for steak; I think she would appreciate my resourcefulness. It is the best marinade for beef I had ever tasted, so I decided to try it on beaver. Rinse the meat and pat it dry, then put it in a Ziploc bag with the marinade. I let it sit six hours, turning the bag over every hour or so. 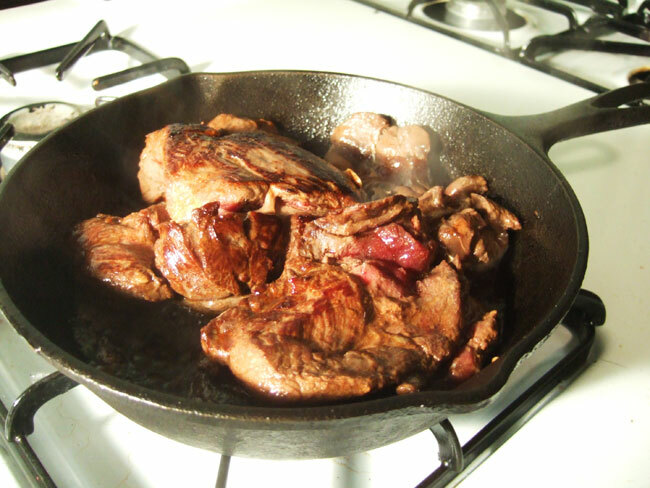 I heated a cast iron skillet with clarified butter until smoking, then added the meat to the sizzling skillet. I browned the beaver two minutes on each side, then put the skillet into a preheated, 500 degree oven. I gave it five minutes in the oven, then pulled it out and let it rest for ten minutes. This gave me meat the was well done on the edges, and medium to medium-rare in the middle. 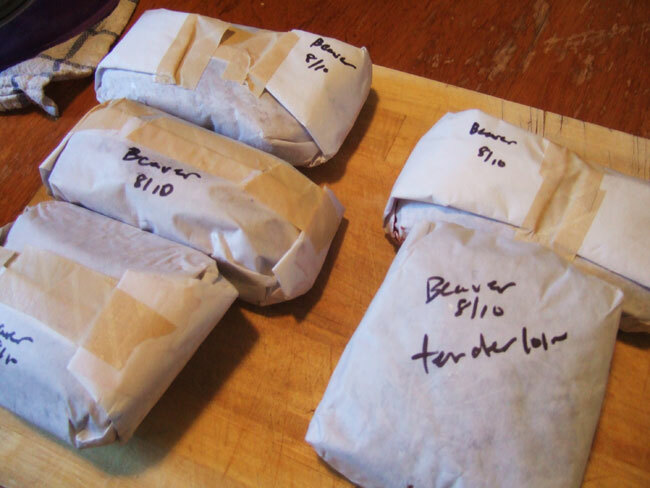 When the French Culinary Institute prepared their beaver meat, they sous vide it: a process by which you vacuum seal food in a plastic bag, then cook it at a very low temperature for a very long time–sometimes over the course of several days. This technique not only produces tender meat, but is prized for creating perfectly creamy soft-cooked eggs. But I don’t have a sous vide. I have the everyday kitchen equivalent: a crock-pot slow-cooker. FCI also got good results by brining their meat first. So I created a brine for my beaver. Put this in a Ziploc bag with the beaver meat and let brine for at least two hours, and up to six, turning every 30 minutes. Remove the meat, rinse it, and pat it dry with paper towels. The exterior will have turned a grayish color. Seasoning. I seasoned conservatively at first, not wanting to mar the beaver flavor. But beaver seems to be one of those meats that can stand up to a lot of heavy seasoning. I used about a teaspoon of “Pasta Sprinkle,” a spice mix from Penzey’s that contains basil, oregano, thyme and garlic; and a couple hearty shakes of Red Pepper Flakes. I cooked the meat on high for 4 1/2 hours; but if you have the time, cook it on the low setting for 8 hours. When it was done, it was tender enough to pull apart with a fork; I mixed it with the sauce and served a few tender morsels to my friends. It. Was. Amazing. Still gamey, and sooo tender. My guests immediately grabbed slices of buttered potato bread and made little pulled beaver sandwiches. The sweetness of the bread mixed with the richness of the meat was the perfect combination. The brine had made the meat incredibly tender, while the acid of the tomatoes broke down the meat’s wild flavor just enough. This recipe gets four stars from me. It’s impossible to mess up and it delivers perfect, delicious meat. So what does beaver taste like? Beef, but more flavorful. Robust, but less gamey than venison. More mild than a dark-meated poultry. 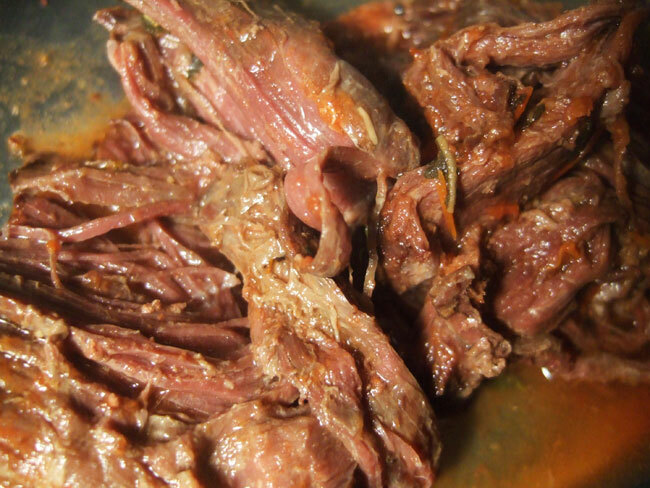 A red meat with a perfect tanginess and richness. And you don’t have to take it from me: everyone who came to my beaver party left satisfied, not horrified, and would willingly eat beaver again any day. My first challenge after my beaver meat arrived was to put it in some historical context and to see if there was a precedent for beaver eating. I turned to Thomas De Voe, the man in charge of New York City’s food markets in the middle of the 19th century, who also wrote The Market Assistant: Containing a brief description of every article of human food sold in the public markets of the cities of New York, Boston, Philadelphia, and Brooklyn; including the various domestic and wild animals, poultry, game, fish, vegetables, fruits &c., &c. with many curious incidents and anecdotes. Did he know how indispensable his book would be to future historians? Professor Kalm, in his ‘Travels in America,’ in 1748, says ‘Beaver flesh is eaten, not only by the Indians, but likewise by the Europeans, and especially by the French on their fasting days; for his Holiness, in his system, has ranged the beaver among the fish. The flesh is reckoned best if the beaver has lived upon vegetables. The tail is likewise eaten after it has been well boiled and roasted afterwards. So, according to what De Voe has heard: 1. Beaver is good roasted. 2. Beaver can be poisonous. (Perhaps not poison, but I suspect, that like bear, the beaver’s diet varies by season from one based heavily on plants and berries, to one based on fish. The latter can give the meat an unpleasant, fishy taste. ) 3. A beaver is a fish, therefore it can be eaten on Fridays. (Good news for you Catholics out there.) 4. Beaver tail is damn tasty. I know number three to be true, thanks to a great post at the French Culinary Institutes’s blog, Cooking Issues. 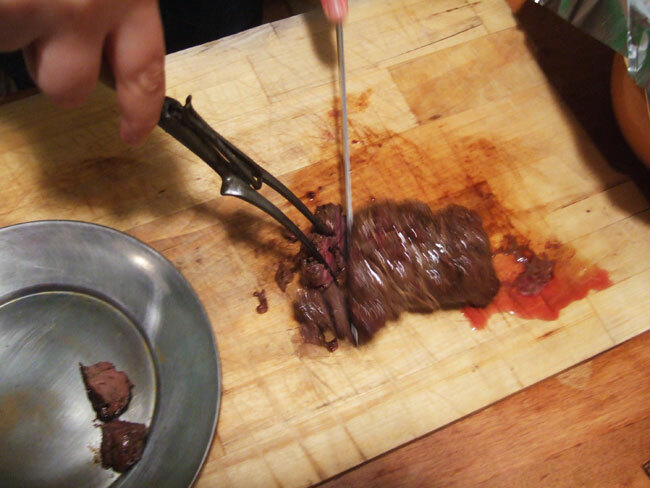 Not too long ago, they ordered up some exotic meats from Crizmer’s outside of Chicago, including both beaver tail and beaver flapper, which are two different things. Of the beaver tail, they said “Beaver tail is straight up fantastic. 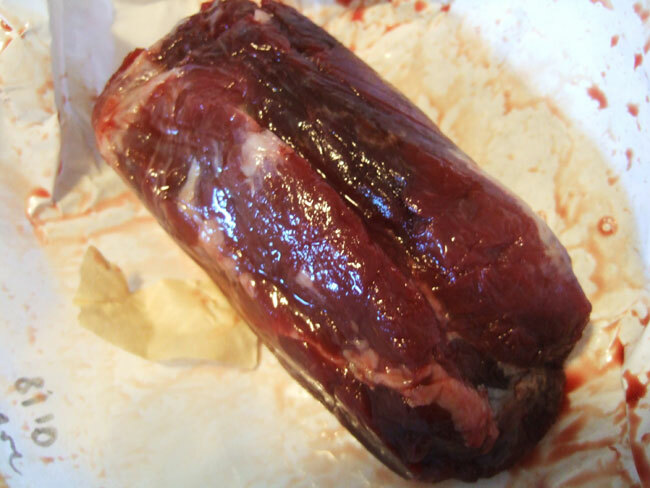 It has a woody-musky aroma and flavor that is unique among all meats I have tried…Man, was it good.” This statement gave me hope, as I prepped my beaver meat for consumption. Tomorrow: recipes and the big beaver tasting. This is going to be a meat adventure. Welcome to your first Alaskan culinary challenge! The object of this challenge is to research, prepare and serve…Much like Iron Chef, view this as the “secret ingredient.” Test your culinary skills and have fun! 1. Shipped item must be consumed withing 2-3 days. 2. Prepared meal MUST be served to at least one person besides yourself. Using the ingredients in a historical fashion (four pounds flour worthy) is encouraged. Documentation and feedback/report is favorable. Future culinary challenges are more likely if previous challenge was given proper attention. Recipe sharing is also favorable. Failure to complete this challenge will result in mockery of the highest caliber. Your partners in crime in the 49th.